Specially built for the Drop-In SIZZLE ZONE™ Infrared Side Burner BISZ300 or Built-In Flat Top Dual Size Burner BISB245. This Carbon colored, powder coated, galvanneal cabinet features increased durability from the two-coat pebbling, finishing system. Two stainless steel drawers are mounted on smooth gliding tracks for under grill storage. Installation is a breeze with knockouts for gas and electrical. Levelling feet ensure a balanced surface, even if your patio isn’t perfectly level. 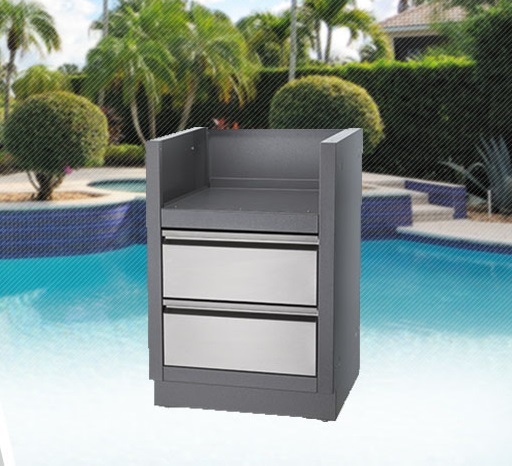 Partner this cabinet with a Drop-In SIZZLE ZONE™ Infrared Side Burner or Built-In Flat Top Dual Size Burner and the perfect OASIS™ cabinets for a custom outdoor grilling OASIS™.